Office Hours - 8.30 - 5.00pm Monday to Friday, Saturday 9.00-12.00 noon. Pick ups and drop offs can be made prior to these hours by prior arrangement. 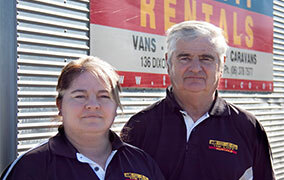 In 2001 after 30 years in the motor industry, Ross Gregory and his daughter Joanne began their new buisness venture. The Lott Rentals was met by high demand in the wider Wairarapa region. Today The Lott has over 30 caravans, as well as wide range of cars, vans, trailers and removal trucks.